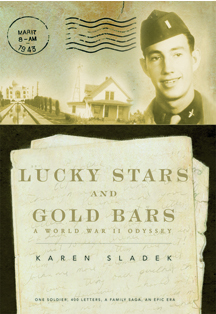 "Letters and memoirs are the truest testimony and the finest memorial for the measure of freedom we enjoy today"
Penlyric Press was established for the sole purpose of publishing Lucky Stars and Gold Bars: A World War II Odyssey by Karen Sladek in order to preserve authentic World War II history and to make the remarkable trove of WWII letters, photographs, and documents available for the edification of present and future generations. This complete, extensive, and firsthand account of one soldier is so rare that no other such historical WWII collection is known to exist. A labor of love, the work was published in accordance with the Chicago Manual of Style, yet exceeds professional standards as evidenced by the Benjamin Franklin Award. Of extraordinary note is that each page (522) is painstakingly designed to flow the text with each related illustration (236), and each page turns exactly right, both visually and content-wise. Your comments are greatly appreciated. Please be aware that by submitting a critique you are granting permission to the author and publisher to quote you. Please include a brief bio unless you prefer to be anonymous.